Everyday is special when you are a father, although Sunday June 17th, 2012 marks an extra special day this year for all fathers. Father’s Day is just around the corner, and every dad deserves the recognition and appreciation that a personalized gift gives him for all his hard work. Make this Father’s Day the most memorable one yet by giving your dad a special gift that is personalized just for him. Your dad is one of a kind, so this year, give him a gift that reflects his personal splendor. MemorableGifts has put together a list of the top 5 gifts to give your dad if you have any trouble deciding what gift is best. Deciding on what to give your dad for Father’s Day can sometimes be a little difficult. He does so much for you everyday that a generic gift just does not do your dad justice. 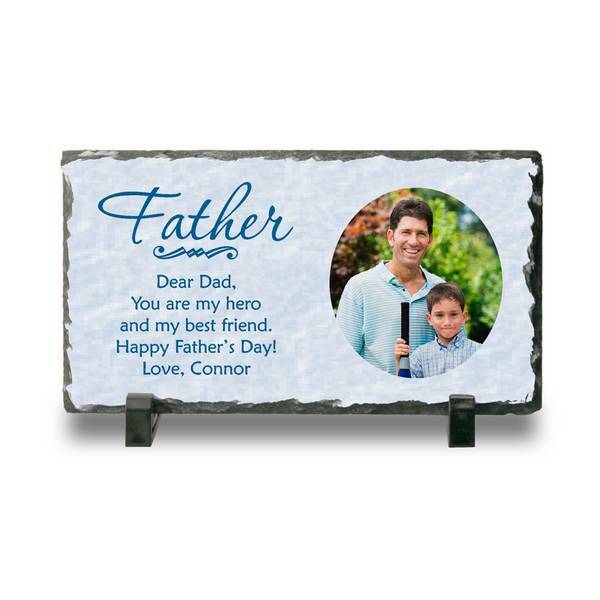 Show your dad just how much he means to you by giving him this exquisite Personalized Photo Slate Keepsake Plaque For Dad. What a wonderful way to show your dad how important he is to you! Your dad will be able to display this thoughtful gift anywhere he chooses, to show off your love for him. This keepsake plaque can be personalized just for your dad by uploading a special picture and by having a loving message engraved. This is the perfect gift for any dad. 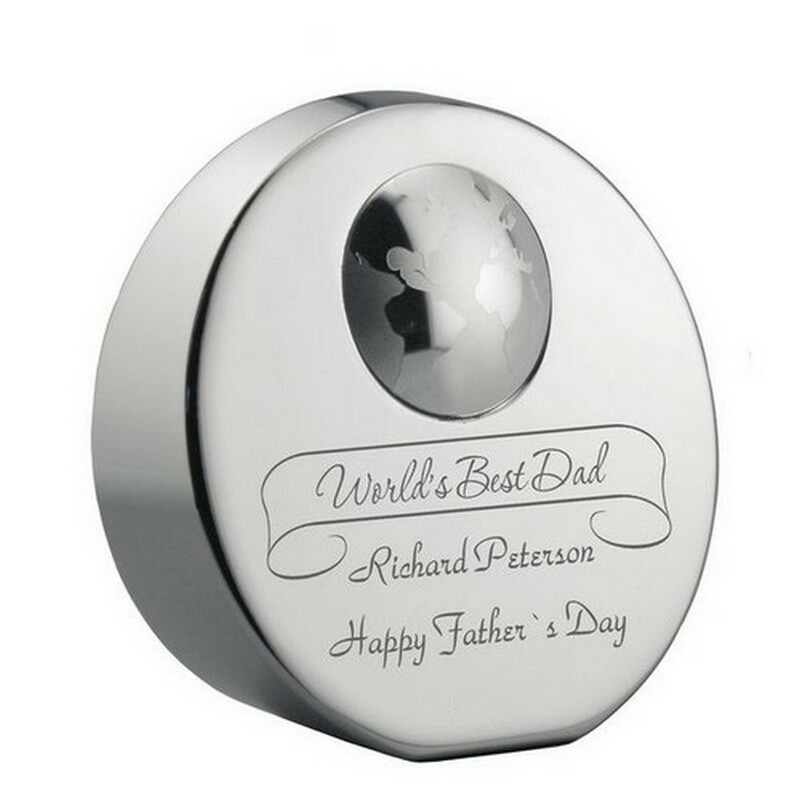 Every dad would love to know that he truly is the World’s best dad, but until the U.N. starts handing out that award you can let your dad know where he stands by giving him this World’s Best Dad Personalized Paperweight Award. It might not be a world recognized achievement, but it will mean the world to him! This is the perfect gift for any dad who works hard, as it will look great out on display on his desk. This next gift is meant for the only man in your household who is capable of taming those grill flames. Help your dad sling those perfectly cooked hot dogs and burgers for the family this summer by giving him this Personalized Barbeque Set for Dad. 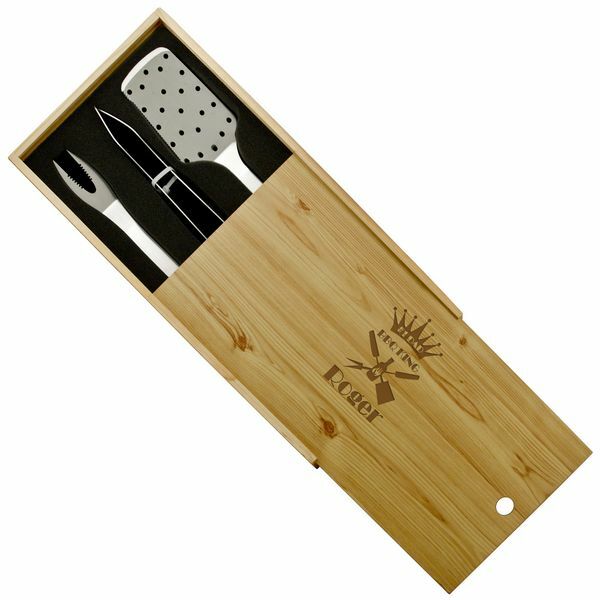 Make his time spent around the grill this summer and enjoyable time with this beautifully crafted set that comes complete with its own wooden case. Let your dad know this BBQ set was made just for him by having his name laser engraved on the wooden box. This is the best gift for the grill master. 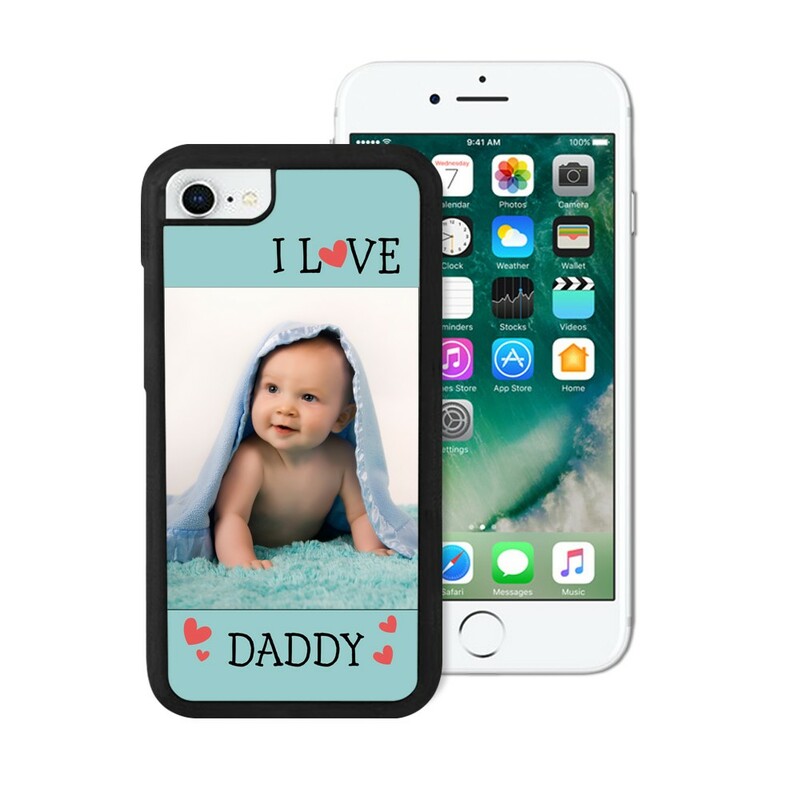 A great gift to give your dad this Father’s Day is this I Love Daddy Photo iPhone 4 Case. These days it is rare to find someone without their mobile phone attached to their hip, which is why this protective case is so perfect for any dad. You can personalize this iPhone 4 case just for your dad by uploading a special picture that will be sublimated on the back of this plastic protective case. Every dad would love to be able to look at his son or daughter anytime, so make your dad’s dream come true with this fabulous gift! If you are unable to think of anything to give your dad that will really impress him with your love and thoughtfulness, give him this exquisite Personalized Designer Pen and Watch Treasure Box. With the elegant design, a personalized gift like this will absolutely blow your dad away. Make Father’s Day a truly special day this year by giving your dad something he deserves. Show your father that all his hard work and guidance has not gone unnoticed. 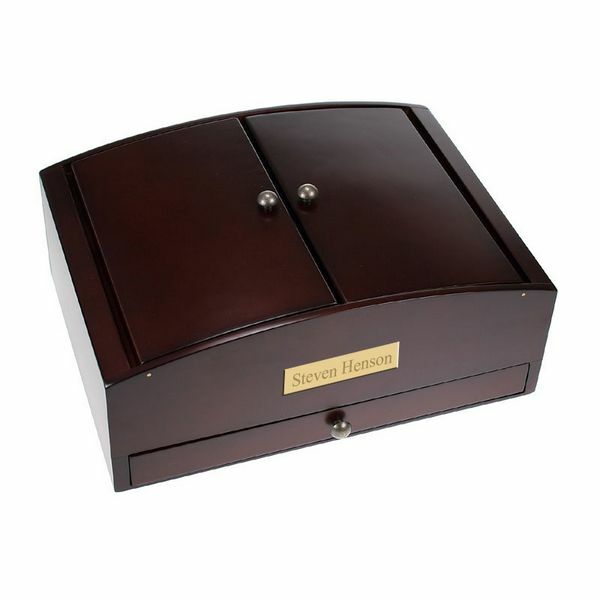 By giving him this special space to store his watches, keys, wallet, pens, etc you are giving him the protection for his possessions that he gives to you. This is the perfect gift for the modern dad with traditional values. Deciding on the perfect gift for dad can definitely present some difficulties, especially when he is the type of guy who expects nothing in return for all his efforts. You can never go wrong with personalized Father’s Day gifts to show him a little recognition. MemorableGifts created this spectacular top 5 gift list to make your job a little easier. After all, we want to make sure that every father is appropriately recognized with a personalized gift that is worthy of his greatness!